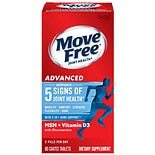 #ad Schiff Move Free vitamins and supplements are buy 1 get 1 FREE at Walgreens.com through 11-10-18. Plus, you’ll get an extra $11.00 off a $60.00 or more purchase with code: GETSCHIFF11 at checkout! Orders $35.00 or more ship FREE.